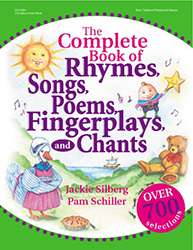 The Complete Book of Rhymes, Songs, Poems, Fingerplays, and Chants gives children a variety of ways to fall in love with rhythm, rhyme, repetition, and structural sequence-important building blocks for future readers. The 700 selections will help children ages 3 to 6 build a strong foundation in listening skills, imagination, coordination, and spatial and body awareness. In this giant book of rhythm and rhyme, you are sure to find your own childhood favorites!